The Society of Jewellery Historians produces two publications for the benefit of its members. 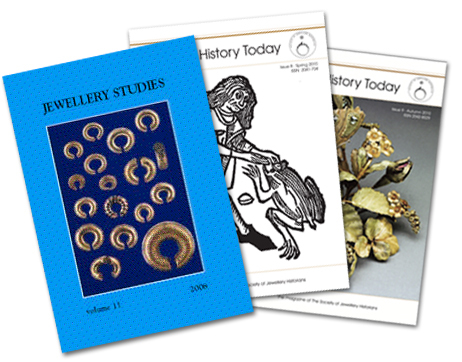 Jewellery Studies is a fully-illustrated peer-reviewed academic journal. Volumes 1-12 were published in hard copy form. Since 2015 it has been published electronically. For contents of past volumes, click here. Jewellery History Today is a full-colour magazine, which is sent to members three times a year, in winter, spring and autumn. It contains information on the Society's activities, together with information about forthcoming exhibitions and other jewellery news, short articles, book and exhibition reviews and a correspondence column. For contents of past issues, click here. If you would like to buy a past issue of either publication, click here for price list and availability. Anyone can buy copies of past issues, when still available, and current members of the Society receive a substantial discount.